This integration will allow you to connect with your Shopify data and start receiving events for your shop, products, and orders. 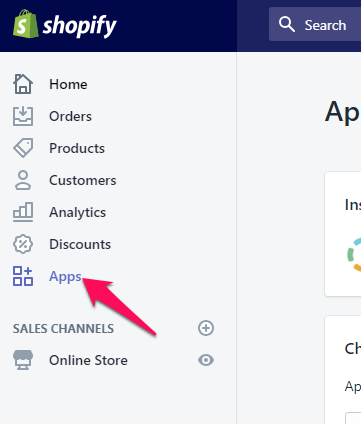 Once you connect your Shopify data it is much easier to feed your BI, your data warehouse, or your custom analytics stack. 2. At the Shop text box, you will need to write the subdomain of your Shopify URL. 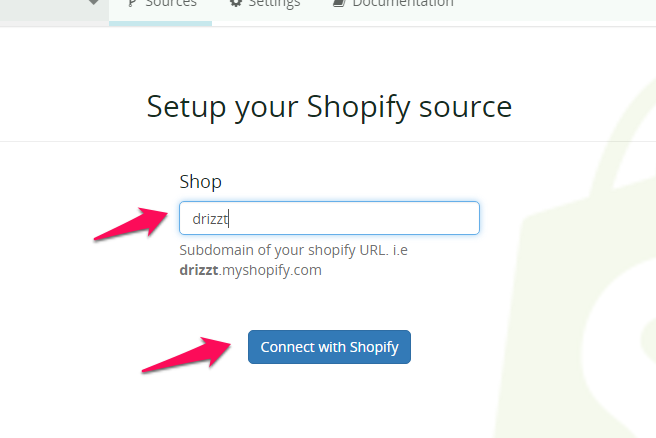 In our example the full URL is https://drizzt.myshopify.com. We are going to need the part drizzt. You will be prompted to authorize Blendo to connect with your Shopify store. Review the text and click Install app. 5. In the new window, check if everything looks as it should be and click Verify & Save. 6. Then you will return back to the home dashboard. 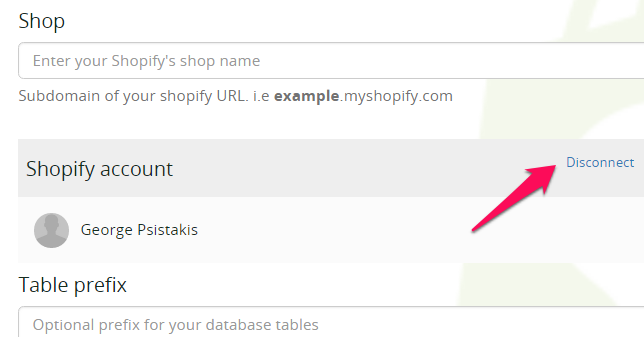 Click on your new Shopify data source. 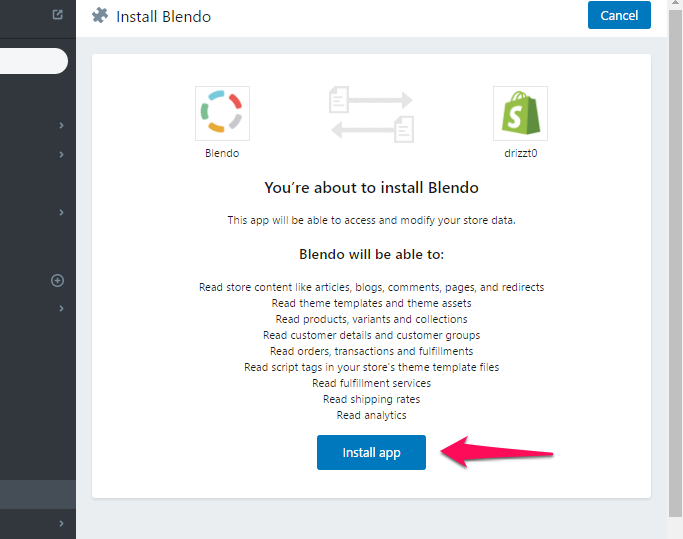 This configuration controls how often Blendo will pull data from your Shopify integration. Loading to your data warehouse could take a little bit longer. Blendo will now connect to your Shopify data source. It will sync your historical data and all the future updates into your destination data warehouse. You will get analytics ready tables and syncs that make sure you will get recent and consistent data. When Blendo first connects to Shopify Data source, will pull all your historical data. Blendo syncs Shopify data based on the schedule and frequency you choose. The default setting is every 1 hour but is configurable from inside the app. The first time Blendo syncs your Shopify data performs a full replication. Then your Shopify data is replicated incrementally. Note that Blendo will only read your data. After you finish the integration with Shopify, you might see its status as Importing from source, Exporting to the destination, or Completed. What Shopify data do I have available? How can I add multiple Shopify Accounts? This guide considers you have connected at least one Shopify data source. If you have multiple Shopify Accounts you may do the following. 4. Click on Disconnect. This will not disconnect from the previously added Shopify Data source. 5. Continue with the normal authentication for Shopify for the new Shop. How can I add re-authenticate with my Shopify account? 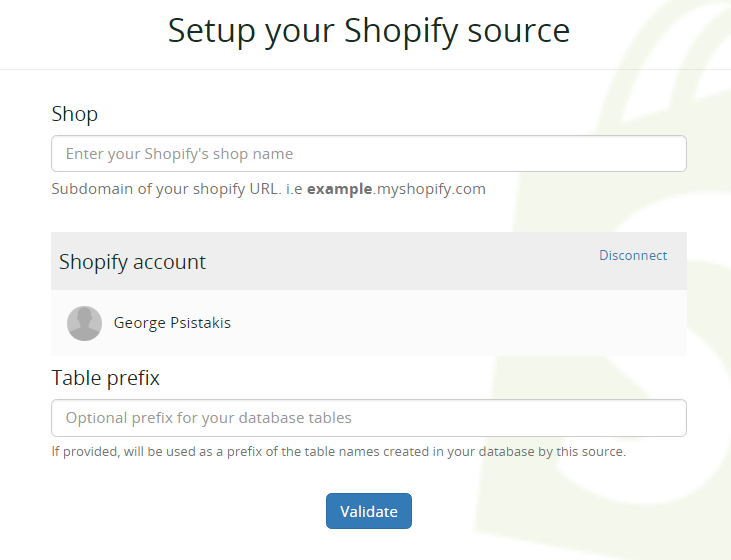 This guide considers you have connected at least one Shopify data source and you want to reauthenticate to create a new data source. 1. Go to Shopify and login to your Shop. 2. Click on App on the bottom of the left sidebar. 3. Find Blendo in the list of apps and click on the Recycle Bin next to it. 4. Provide some feedback (optional) if you like and click Uninstall. 5. 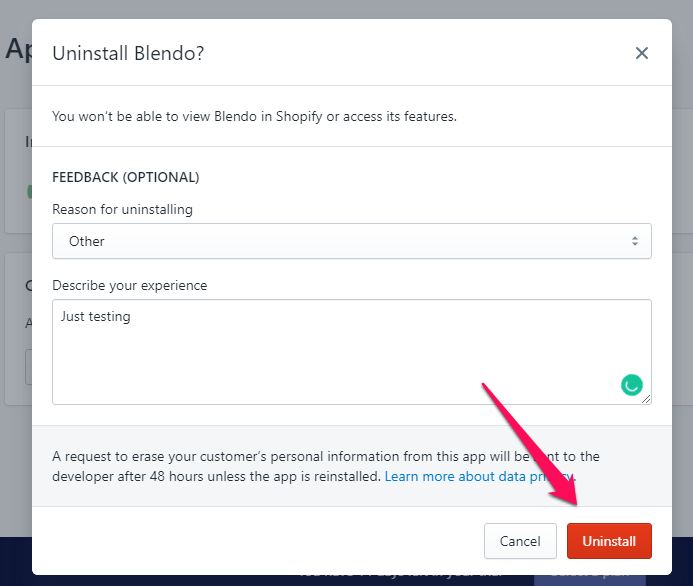 Then recreate the Shopify data source from Blendo dashboard. 7. Click on Shopify connector and continue with the normal authentication for Shopify.